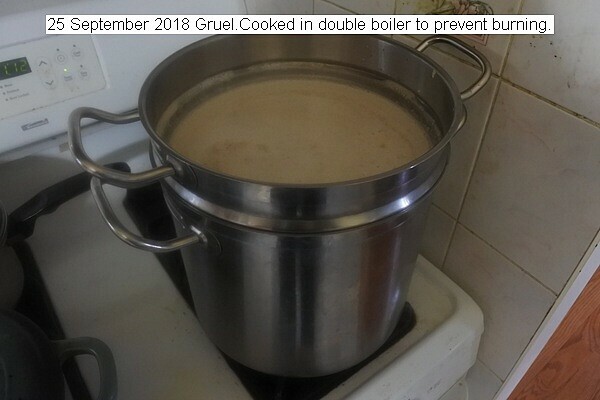 About a ten day supply of gruel was made. It will be stored in plastic containers in the freezer. The ingredients are blended with water, garbanzo chickpeas, flax, wheat, sunflower seeds, nixtamalized Indian corn, and almonds. The material is cooked in a double boiler for about an hour to prevent burning. A bowl is ingested warmed in the microwave with milk each morning for breakfast. This entry was posted in Uncategorized and tagged 25 September 2018 Gruel, 25 September 2018 Gruel Breakfast Cereal. Bookmark the permalink.